Simple desserts are appreciated on busy Spring days when cleaning chores are the focus. We rarely eat desserts anymore, but I wanted to try a new approach by combining apples and blueberries with an uncomplicated topping. I justified it as an experiment and a blog post. After all, not everyone is avoiding sweets. I did it for all of you. The cottage on the lake survived our three months absence. 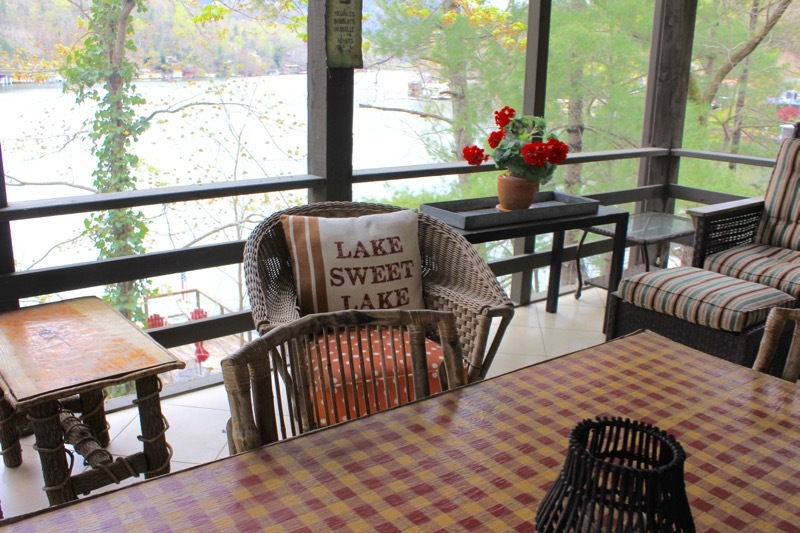 We put the porch back together with pillows and a clean sweep. The dogwoods are blooming but the pollen has not yet coated everything with a yellow powder. The lake is clear and at full pond. It is good to be home. 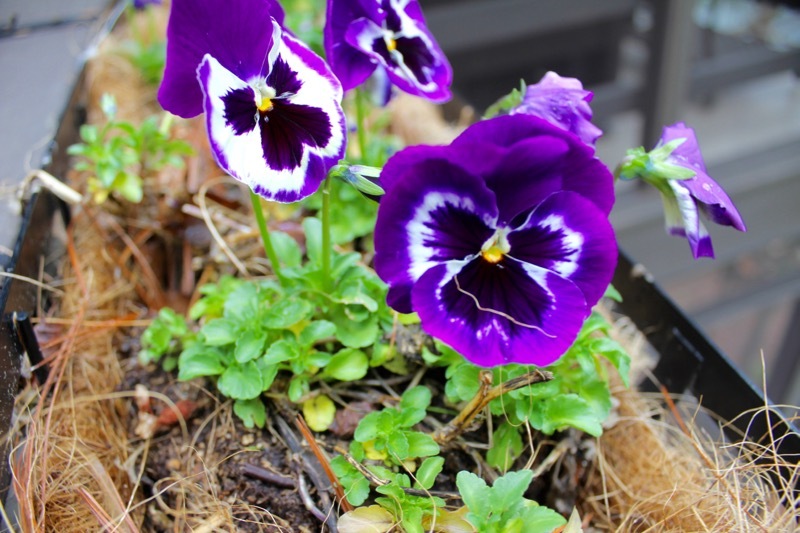 The flower and herb containers need a good cleaning but the pansies survived the winter. There is still much to do, but working in the dirt is just part of the spring clean-up. I was pleased with the way this dish came together. The fruit mixture is combined in one big bowl, placed in a casserole and baked for awhile on its own. 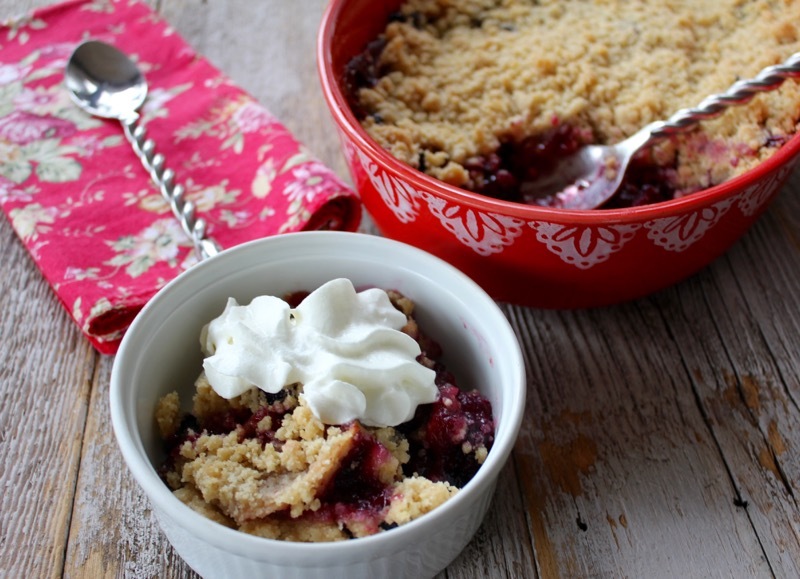 The crumble is a simple mixture of flour, sugar and butter. Serve with ice cream of whipped cream. Happy Spring! Preheat oven to 375 degrees F. Lightly butter an 8″ x 8″ baking dish. Combine the fruit with the sugar and cinnamon in a large bowl. Mix the cornstarch with the orange juice and add to the bowl. Mix everything together and dump into the baking dish. Bake for about 45 minutes. Meanwhile prepare topping. Mix flour and sugars in medium bowl. Add the butter. Rub in with your fingertips until mixture forms coarse crumbs. Sprinkle over fruit. 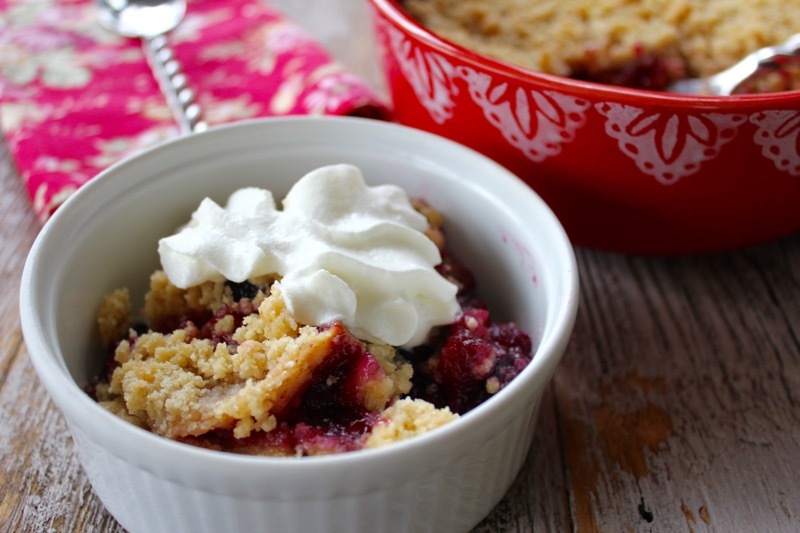 and bake until fruit is tender and bubbling and topping is crisp, approximately 35 more minutes. Best served warm. The crumble looks delicious and the pansies are pretty. Glad you’re home. Enjoy the beautiful spring landscape. Happy Birthday this month Darla. Will be with the kids at Easter, not sure if you will be too. But looking forward to seeing you. Welcome home and happy spring, it has to be lovely at the lake. 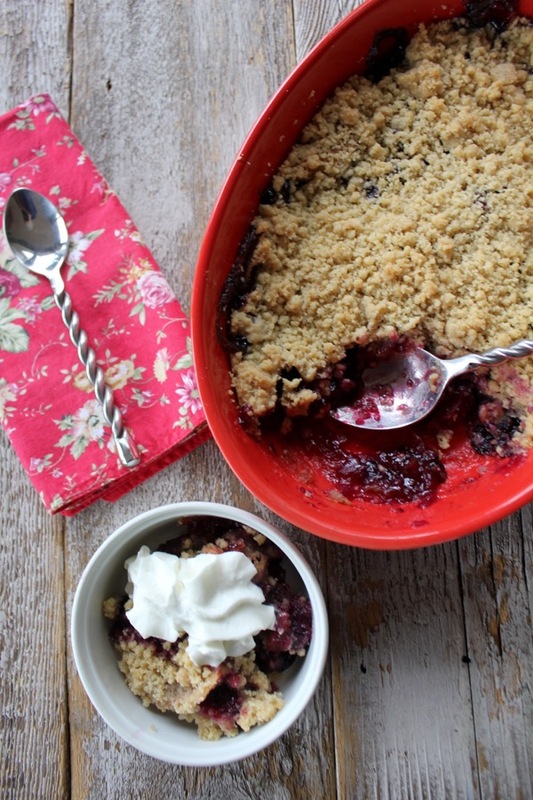 Never thought of this combination for a crumble but it certainly does look good. Thanks Karen. Blueberries are out of season and kind of expensive right now, so mixing in apples makes sense. But kind of hate cooking out of season. This was good. Ah, to be home again! I like the fruit combo of apples and blue berries idea. Will definitely give it a try. Hi Treva, Home is always great. My own kitchen, pots and pans and casseroles. I get more creative here. Thanks for following along. This post was published by Penny on April 6, 2019.